EGYPT: Anarchists in Egypt, will the real Black Bloc please stand up? Core members of Egypt’s Black Bloc hardly ever give interviews, adding to the mystery and confusion that surrounds the group. Your Middle East’s Goos Hofstee was able to get one such rare talk. The young man at the other side of the phone sounds hesitant. “How do I know I can trust you?” he says, his voice full of suspicion. “You don’t”, I reply, “but I have no interest in ratting you out to the intelligence services”. This man, we’ll call him Mohamed, has good reason to be anxious. The small group of friends he belongs to form the core of the original Black Bloc, the mysterious group that first emerged on the streets of Cairo this January, when protesters commemorated the two-year anniversary of the Revolution. Protesting against the Morsi regime, the Bloc openly declared they would not eschew violence to realise their goals. 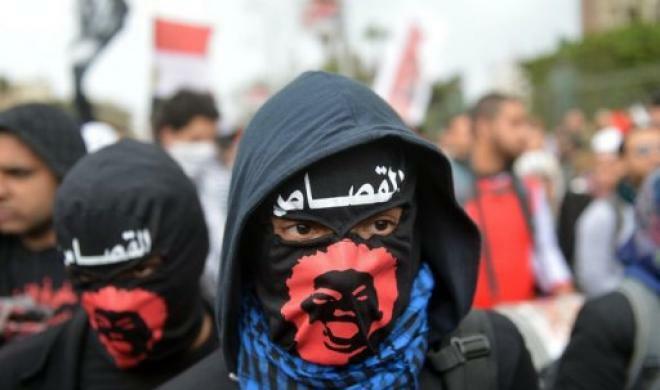 Indeed, the group has since been involved in several violent incidents, such as burning the Muslim Brotherhood headquarters in the Sixth October area, storming the media offices of “Brothers Online,” and torching the Freedom and Justice Party newspaper headquarters. Using slogans such as, “Our mess prevents chaos” and, “We are confusion that prevents confusion”, their protests quickly prompted a violent crackdown on Black Bloc members. The prosecutor-general’s office asked citizens to arrest any person suspected of being a Bloc member, even if they did as little as merely wearing all black clothing. A resulting manhunt saw citizens hand over activists to the security forces. Young Egyptian men, including some of Mohamed’s friends, were betrayed, or randomly arrested and detained on charges of “terrorist activities”. Since the removal of President Morsi, the newly installed military regime continues to target opposition protesters and conduct covert investigations into suspected Black Bloc members. To remain anonymous is therefore not only essential for the continuation of the group’s work, it is also crucial for its members’ personal safety. Egypt’s Black Bloc grew out of their struggle for liberation from an authoritarian system, only after non-violent civil efforts had failed. While the group’s tactics originated out of a plan to protect women revolutionaries by forming a protective human shield around them at protests, the violence of the police and armed forces against peaceful protesters meant that the Bloc soon began to fight against the Morsi regime. Since Morsi was ousted, the Bloc has been fighting the military regime. The bloc’s goal has evolved to the “defence of the Revolution” against any dictatorial regime, be it military or religious. The Bloc’s members claim to have no affiliation with existing political parties and maintain that they have nothing against state institutions per se, “but against control by a particular system, the supremacy of a certain group.” They further contend that “the best thing is to hit the existing system and its economy by sabotaging the system’s institutions and not ones belonging to the public. With a physical presence in more than eight cities across Egypt, and an increasingly stronger online profile, the Black Bloc is still growing in popularity. However, this growing presence poses a problem that is directly linked to the structural set-up of the group. While the Egyptian authorities are treating “the Black Bloc” as a singular, defined group, the reality is much more obscure. As one member stated, the Black Bloc is “not a political group, but rather an idea that is not monopolized by anyone.” This secrecy and self-professed dispersed structure, in combination with the growing popularity of the Bloc’s goals and actions, has resulted in multiple Black Blocs mushrooming all over Egypt. There are several dozen Facebook pages claiming to represent the Black Bloc in Egypt, including ones for specific governorates and areas, like Black Bloc Upper Egypt, Black Bloc Cairo and Black Bloc Port Said. Moreover, a quick Google results in a multitude of video messages by activists, twitter feeds, and pages using the Black Bloc description and logos. It seems that many of the activists are affiliated with the so-called Ultras, the hard-core fans of Cairo’s al-Ahly and Zamalek football clubs who are known for their radical politics and experience in fighting the police. However, while the Black Bloc activity is concentrated around these Ultras, it’s not limited to them, and certainly not all activists who’ve worn the balaclava or black hoodie are members of one of these football clubs. How closed or open the groups identifying as “Black Bloc” are in Egypt right now is thus unclear, making it difficult to determine the actual scope of the movement. Black Bloc members communicate mainly by online social media, and as their members’ identities are unknown and faces remain unseen, it is almost impossible to confirm the authenticity of those who claim to speak in its name. Moreover, due to the ever present threat of arrest, and their deep rooted suspicion of the media, the core Black Bloc members are hardly ever willing to give interviews, which only contributes to the mystery and confusion that surrounds the group. When, after some asking around the proverbial grapevine I managed to track down Mohamed, who was one of the founders of the original Black Bloc core group, it quickly transpired that he and his fellow Bloc founders have actually distanced themselves from both the multiple Black Bloc groups and even the Black Bloc label itself. During our short interview, he explained who the real Black Bloc was, how it got infiltrated and turned sour, and what the future holds for those who made up the original group of protesters at the core of the former Bloc. What was the reason you set up the Black Bloc? Who is the real Black Bloc? What was the background of these first Black Bloc founders? What does that idea entail? What would you like to see happen in Egypt, what is your vision? Who are your enemies now? What are your plans as a group now, what does the future hold for you? With that, Mohamed says he has to go. He once again urges me not to reveal his identity. I tell him that I won’t, and that I’m not even sure his name is really Mohamed. To me, and to us all, he remains nameless, faceless. There is no doubt in my mind, however, that we will see him somewhere among the anonymous, masked protesters on the streets of Cairo again. Goos is a freelance journalist based in London and Cairo. She writes regularly for Your Middle East. Posted on November 3, 2013, in North Africa and tagged Black Bloc, Egypt, Egyptian Anarchists. Bookmark the permalink. 2 Comments. Really interesting international and more importantly, foreign account of black bloc and anarchism. Anarchism isn’t just a western fad; although it may down from a different background, the universality of oppression is felt across nation borders. In light of the revolutionary awakening of the North African and Middle Eastern countries and the growing wave of protests in Europe it is extremely important for these movements to work not only in parallel, but to support each other. Unfortunately, the media image of Islamic countries in Europe and European materialism in Muslim regions affects not only the stereotypical image of the majority of society, but also the anti-authoritarian circles. It is therefore necessary to get to know each other, to see points of contact and to understand respective local conditions. It is important, because finally those two movements face similar challenges: the implementation of a liberal economy and the threat from the extreme right, whether Christian or Islamic. They have also similar objectives: the fight for a free and self-governed society based on tolerance, equality and openness, the society in which the social side is placed above the mercantile. It is those common goals which make a fear for the ruling and that is why they generate artificially the conflict of civilizations. And it is up to us whether, in this turning point of the social awakening, that conflict will become a reality, or we start a joint struggle for the common society. Through this network we want to create a platform for discussions, for presenting the issues of struggle and their local conditions and differences, for presenting and explaining undertaken actions and planning joint activities in future. There is one World, and one Struggle.